Hello everyone: I love quilts but I've never made one, I've seen them on craft shows and on Pinterest and I admire the amazing and intricate designs on all of this wonderfully beautiful works of art. I have a card to share with you today for the "Less is More" WEEKS 255 and 256 challenge with a theme of "HOMESPUN" and the "Ruby's Rainbow" challenge #119 with a theme of "Get Well", here is my card. I had this set for a very long time, unfortunately I don't know where it came from, where I got it or the name of it and I apologize for that. In my defense, back when I started buying stamp sets, the thought of having a blog was never on my mind so I neglected to save names and companies from a bunch of sets. Anyway, this set comes with 12 different quilt block stamps, a pair of scissors, the spool and threaded needle plus several really sweet sentiments, the one on this card is one of them. As always, I stamped this images onto Canson water color paper with Stazon Jet Black ink and colored them with my SU markers. The sentiment is stamped with Wild Wasabi ink. Here is a picture of the inside. I feel so good that I'm sticking to the promise I made to myself about finishing the inside of all my cards before posting them on my blog. The sentiment is from a retired SU set called "Perfectly Penned", I just love the font on all of them. I want to thank you for stopping by today, until next time, happy stamping. Hello Everyone: I have another Christmas card to share with you today, this time, it's to participate in the Pals Paper Arts sketch challenge and in the Muse Christmas Visions challenge, here is my card. 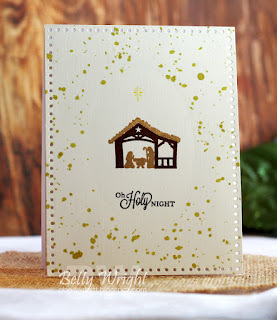 This image is from a Stampin Up! set called All Ye Faithful and all of this images are simply beautiful. I stamped it onto Canson water color paper, die cut it and colored with SU markers and the aqua painter. I die cut some silver foil paper with a Spellbinders scalloped die set, I just wanted a bit of a pretty edge on this image. I cut a piece of Vellum and using one of the SU Gorgeous Grunge stamps, I stamped this one with Versamark Ink and heat embossed it in silver. This image really doesn't need any more bling. The sentiment is from the same set and it's stamped in Cherry Cobbler, the image at the bottom is from a retired Flourishes set called Christmas Candles. This is the Muse for this week.